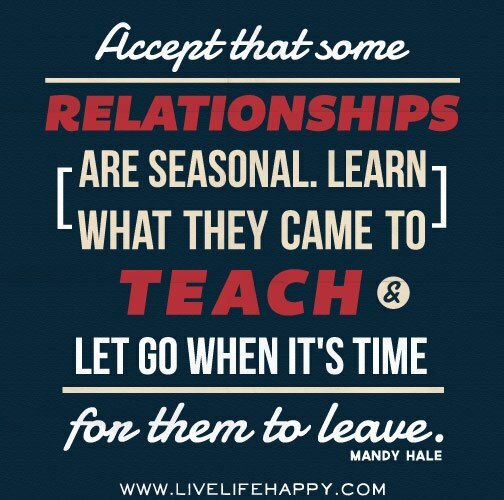 Healthy Relationship Checkup: Are we friends for a season or lifetime? Do you and your friend have respect for each other? Does your friend support and truly care about you as a person? Do they want to see you do well in life? If the answer is “no” then it is time to move on from the friendship. Sometimes friends grow apart or move on. In the ebb and flow of friend relationships, those that were best friends can become associates, and sometimes even fond memories. “Seasonal” friends, are friends that you have during a particular stage of life. Examples include friends from middle school who lose touch in high school, or people that you worked with at your first job but no longer see or stay in touch with now that you’re working someplace else. Sometimes seasonal friendships last for months or years before they eventually fade. Even these more seasonal friendships should still serve a positive purpose in your life. Lifetime friends are the kind of friends that we still have today and will be in our lives forever. These are our best friends. It’s normal for “lifetime” friends to argue or disagree on occasion. These relationships are still healthy if those involved work through conflict in a way that promotes respect, understanding, and compromise. Unfortunately, we don’t always have control over the duration in which the people we care about are in our lives. We do have control in making sure we are in healthy friendships. Remember that healthy friendships are built on respect, trust, and honesty. True friends do not try to get you in trouble, control you, manipulate you or are violent to you in any way. It is better to go through life alone than to have “friends” who don’t really care about you. So whether your friends are in your life for a season or lifetime, please make sure that these friendships are healthy ones.